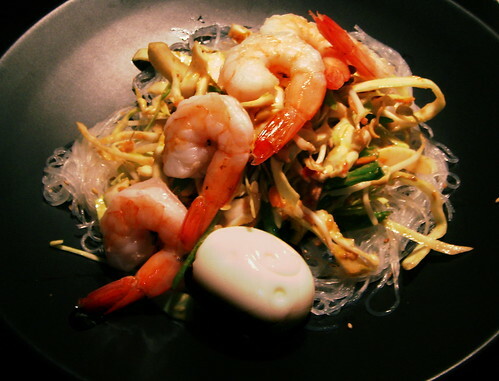 peanut cabbage salad with shrimp over bean sprout vermicelli, originally uploaded by aarn! +10th October, 2008+. sliced up some cabbage, baby portobello mushrooms, shredded carrots, and julienned green beans, tossed that with some bean sprouts in a dressing consisting of some canola oil, chopped red chili pepper, crushed garlic, a spoonful of peanut butter, a splash of sesame oil, pinch of cinnamon, a pinch of salt, some lime juice, a little white vinegar, and a hefty squirt of honey. served topped with some shrimp, over a bed of bean sprout vermicelli which had been chilled and tossed in a little bit of sesame oil and some sesame seeds, with a hard boiled egg shaped with a bento accessory.